Eight-year-old Lauren of Sara Leach's Slug Days (Pajama Press, 2017) has returned and now the young child on the autism spectrum must find new coping strategies beyond the school and home situations with which she contended in her first book. Lauren and her parents and baby sister Lexi have driven from western Canada to North Dakota for the wedding of her Auntie Joss, who is getting married to Almost-Uncle Charlie. It's a long drive but far better than a repeat of the screaming plane fiasco years earlier. But the travel stress is just step one in the journey that Lauren must take to act as Auntie Joss's flower girl. She must also prepare herself for the many people who will be present, including her cousins: Sophia, 12; Zoe, 10; and Kevin, 9. 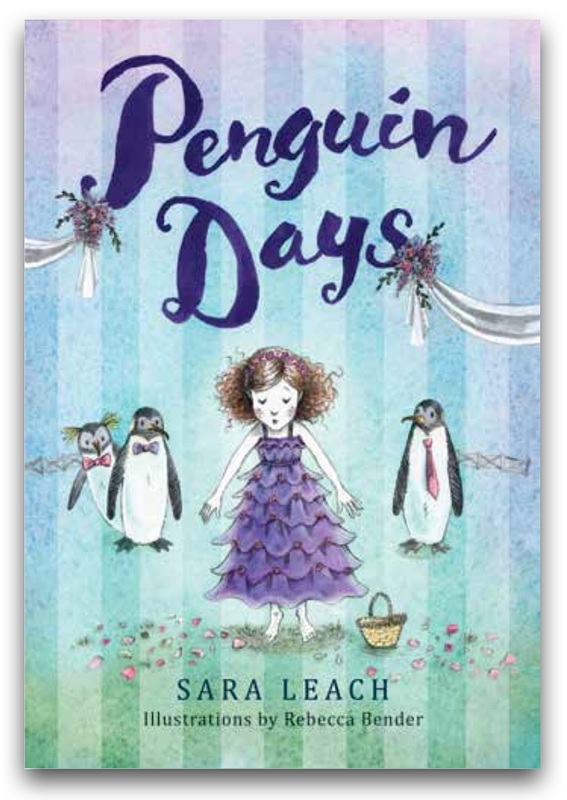 But Lauren's unrest moves into the realm of confusion when Kevin mentions that he has to wear a penguin suit (slang for a tuxedo) and Lauren thinks wearing a penguin onesie would be preferable to the itchy purple flower girl dress she must wear. Unfortunately, when she learns that Zoe and Sophia will also be flower girls, and she twirls in her dress like Sophia, she makes herself dizzy and throws up. The reactions of those around her embarrass her and she dashes outside and encounters Kevin who takes her to see the cows in the barn. Though he warns her about being in the barn, she climbs onto fence and falls into a stall with calves. In the mayhem of her screaming, the calves run out and Almost-Uncle Charlie comes to the rescue. From the dress to the barn and the rehearsal and its dinner, things always get resolved when Lauren remembers to use her strategies like square breathing or focusing on things she likes to talk about, like lizards and penguins, and when those around her consider how stressful new situations are for her and attempt to make things work for Lauren. But there are many circumstances which Lauren must endure first in order to get through to the other side of okay. 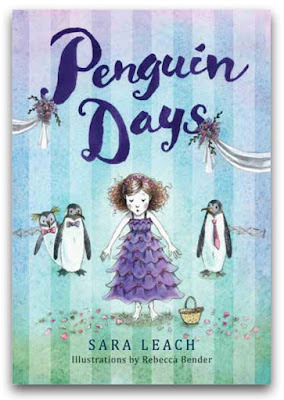 Thankfully Sara Leach shows us that Lauren can have slug days when everything goes wrong, and penguin days when she has to dress up and get along with people she rarely sees, and still have wonderful butterfly days when all is right with the world. 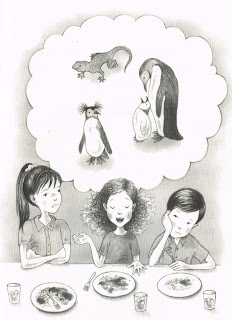 With the addition of Rebecca Bender's charming black-and-white illustrations that depict Lauren in all her moods, Penguin Days becomes a story of resiliency and overcoming anxiety and stressful situations for all children, with ASD and not. 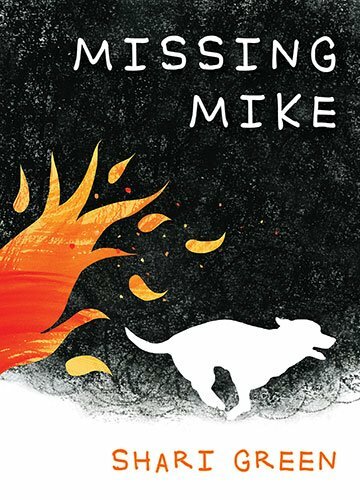 If you notice that the book cover is larger than I usually post, it's because Sadie, the book and the girl, should not be relegated to the back or to a corner to be forgotten. 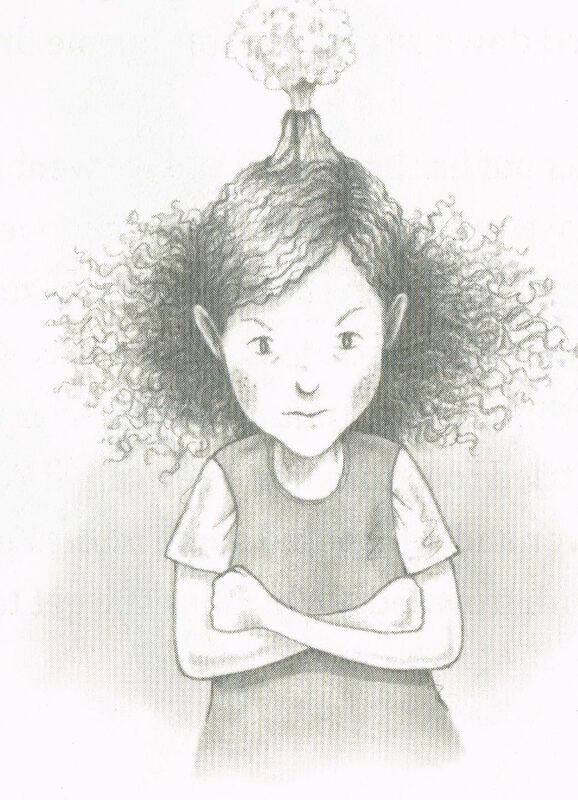 In her life, Sadie was neglected and abused and she may have felt insignificant, but she is courageous and responsible, and she deserves to be noticed–and not because of her stuttering–and her extraordinary efforts appreciated. 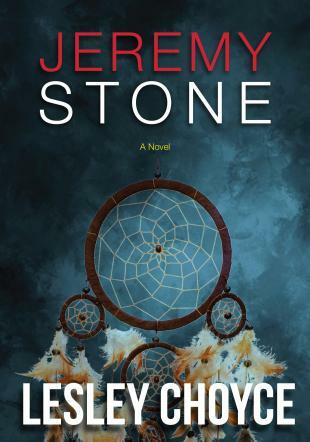 Sadie begins with the murder of Sadie's thirteen-year-old sister, Mattie Southern, after she'd left their home in Cold Creek, Colorado, ostensibly to search out their mother Claire, who'd left 3 years earlier. Mattie had never given up hope on her mother, an addict who'd showered her meagre love and limited attention on her youngest daughter and essentially ignored or was hostile to her eldest. 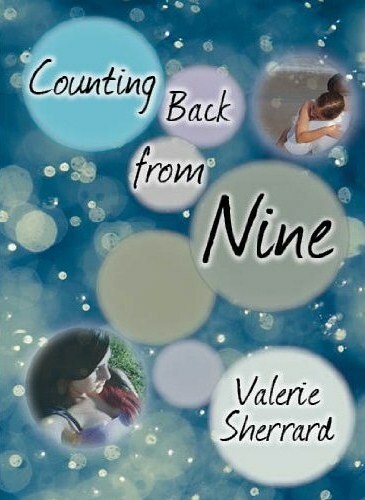 Sadie had given all of herself to her baby sister and mothered Mattie even more, when at 16, it was just the two of them, abandoned and living in a trailer park run by their surrogate grandmother, May Beth Foster. When Sadie disappears eight months after her sister's murder and her car found abandoned the next month, May Beth contacts WNRK New York to get some media attention and help. So begins a serialized podcast, The Girls, by producer West McCray, who pursues Sadie's story and consequently Mattie's as well. 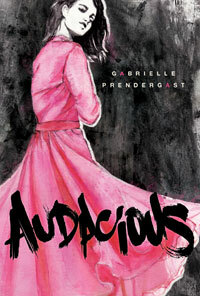 Sadie alternates between The Girls podcast and Sadie's telling of her pursuit of justice for her sister. West's podcast includes narration and interviews with persons of interest as he tries to locate Sadie, all the while unravelling her story. There's May Beth Foster who acts as his home base for information and clarification, and then the people Sadie meets along her journey. 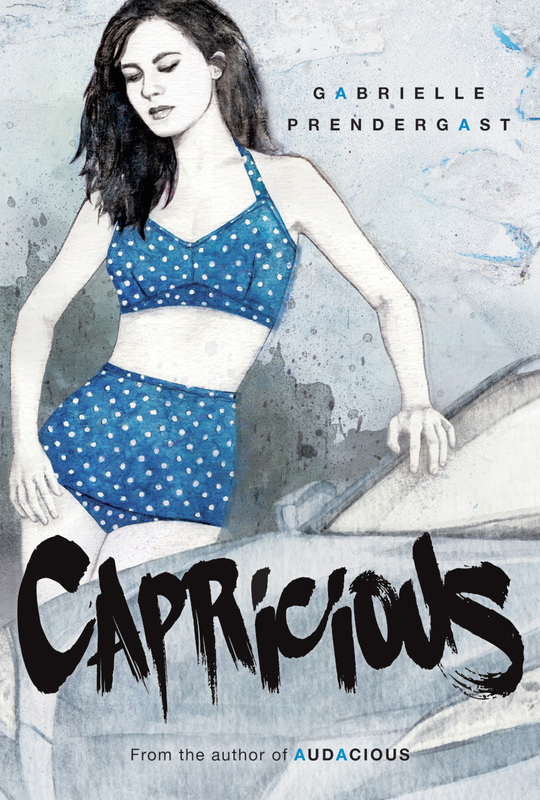 The chapters based on Sadie's pursuit of Mattie's murderer begin at an out-of-town diner where Sadie suggests she's looking for her father, always showing a photo of her family with Claire's ex, Keith. 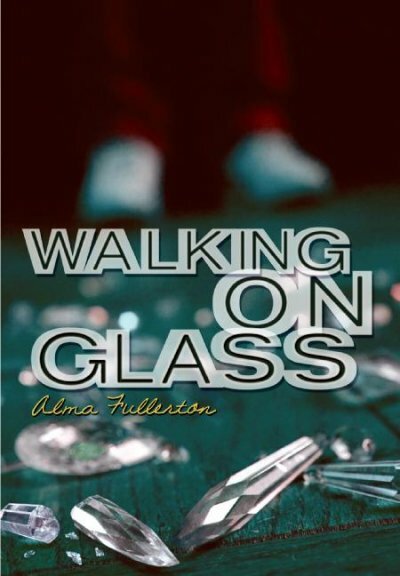 From that starting point, she gets one lead after another, desperate to locate the man she is convinced is responsible for Mattie's death. Mixed with reminiscences, many unsettling, as triggered by those she meets, Sadie must uncover Keith's story, told from the points of view of those who considered him a good guy and those who won't reveal much from the cloak of shame and trauma. Regardless, she pursues and inevitably helps in ways she might never know. Courtney Summers always tells bold stories, whether based on zombies (This is Not a Test, 2012; Please Remain Calm, 2014), on sexual assault and shame (All the Rage, 2015), on bullying (Some Girls Are, 2010) or self-destruction (Cracked Up to Be, 2008). They immerse the reader in tense situations of agonizing brutality, emotional and physical, that rarely have happy endings. But that's reality. Life is not neat and it's not fair. It's raw and real and not for the faint of heart. Courtney Summers sugarcoats nothing. Nothing at all. Even as West McCray speaks to witnesses or persons of interest, they spin Sadie's story with an effort to make themselves look better. It's not honest but it's real. Take Claire, for instance. This woman cared more for the child who looked like her than the one who didn't (and blames that on her youth, her mother's death and May Beth); neglected her children in favour of her addiction; sends an abuser packing only when she suspects he might have attacked her favourite; abandons her children for years; and blames West McCray when he can't find Sadie. Yikes. 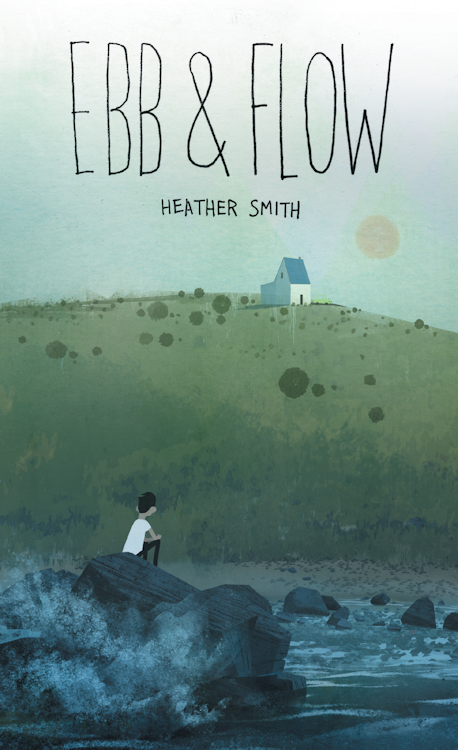 Sadie's story is gut-wrenching in itself: bullied for her stuttering, neglected by her mother, abused by her mother's boyfriend, abandoned, becoming a surrogate parent to a resentful child, and grief-stricken for her beloved sister. Her story is almost too much to take. 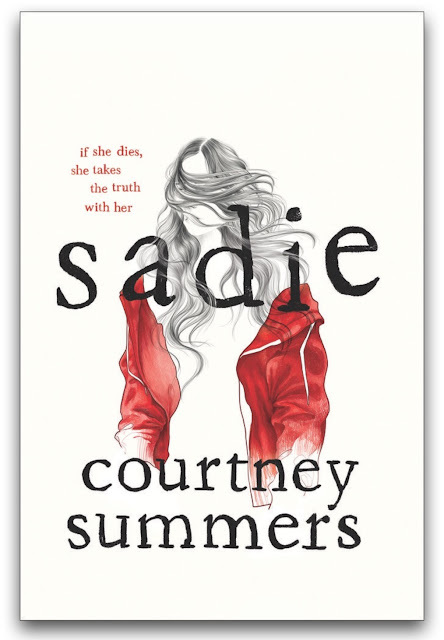 Don't look for a happy ending in Sadie, and it's not because Courtney Summers ends Sadie with another tragedy. 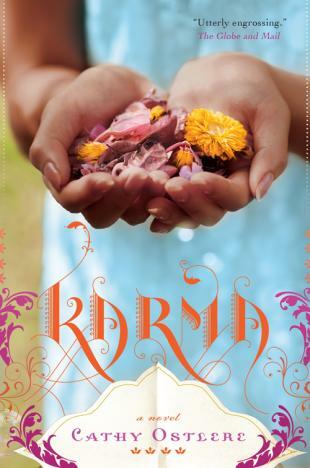 It's just hard to tell what kind of an ending Courtney Summers has given readers. While there is justice, Courtney Summers also leaves a gaping hole in Sadie's story that readers will need to fill, either with hope for a new story for Sadie or with another tragedy to complete her original one. 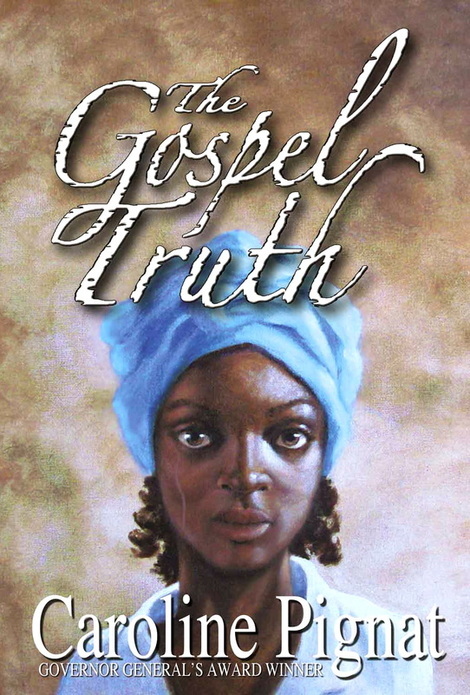 Read Sadie and let me know what you think happened to this fierce young woman because her story is far too important to let her be forgotten. When life gives you lemons, you make lemonade. When Life Gives You Demons, the kind that possess people and make them levitate and revolve their heads, you get an exorcist. But if you're sixteen-year-old Shelby Black, who is training to become an exorcist with her Uncle Roy, a priest, sometimes you're just not the exorcist who's up for the job. There is so much for Shelby to learn about exorcising demons. She's learning how to detect them and she always carries her silver crucifix, handcuffs, and bejeweled spray bottle of holy water. She's almost got the Latin incantations right and is diligent about writing reports about the exorcisms they conduct. Shelby really wants to help out, especially as Uncle Roy is seventy and exorcisms seem to being taking more out of him now. But she's still a novice, only studying how to conduct exorcisms for the past five months, ever since her mother Robin left suddenly to train at some secret exorcism school in Italy. Unfortunately Shelby fears her mother's departure had more to do with the hurtful things she said to Robin in an argument the night before. While Shelby seems to keep bumping into possessed beings–and even a few suspected possessions that aren't–she's crushing on her peer tutor, Spencer Callaghan. But there's some weird stuff going on with him too. Spencer's brother Mike has a tattoo of the sign of the beast i.e., 666, and a dog called Cerberus. But Spencer gives her a black onyx protection rune necklace. Does he know something? How is she going to tell him what she is, especially after she learns from her uncle that her mother had become possessed while doing an exorcism and now may be a portal to the underworld? 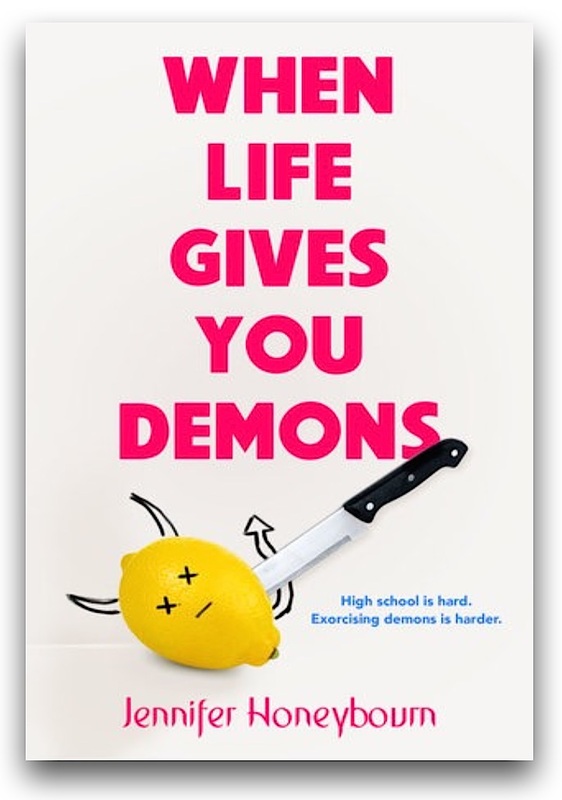 When Life Gives You Demons is not horror, though it could have been. There are creepy demons. The man's face contorts, and he's spitting and foaming at the mouth. 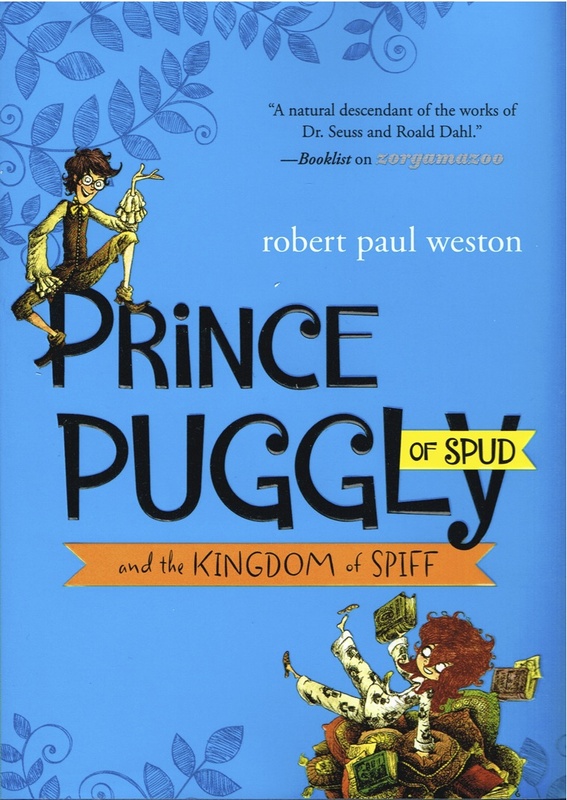 And then–oh Lord–the head starts to revolve on his neck, bones cracking and popping, until it twists all the way around and his face is on the wrong side of his body. 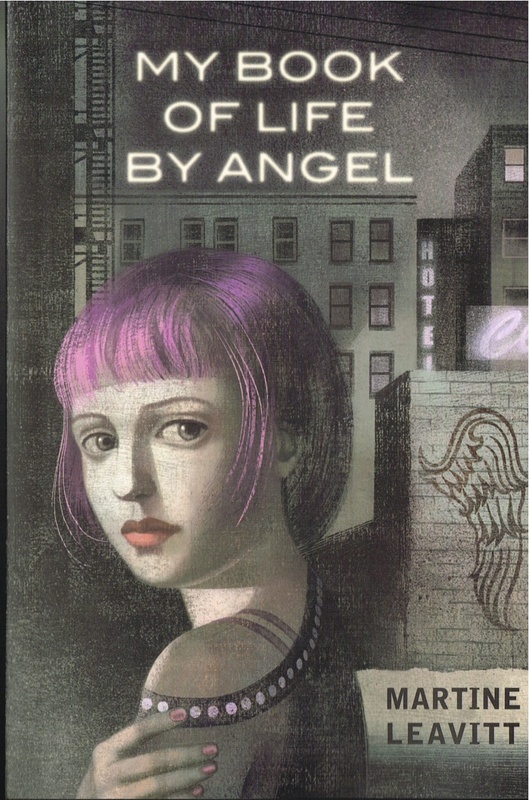 But Jennifer Honeybourn gives Shelby a humourous sarcasm about her unconventional vocation, seemingly unimpressed by the possessed she encounters. I suppose it could get a little weird seeing demons but, to Shelby, it's more annoyance, especially when she's on a first date with Spencer. I am not a horror fan and suspected that Jennifer Honeybourn's story might be a bit too much for me but I was wrong. 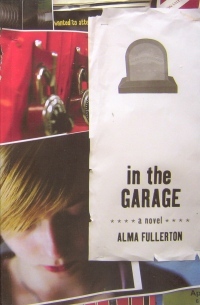 It's the right mix of teen angst–though perhaps a little different than that for most teens–with Shelby crushing on Spencer while trying to find and save her mother. There's suspense, a little romance, some family conflict, and those demons, making When Life Gives You Demons a great YA rom-com for readers who like a little paranormal with their flirtations. 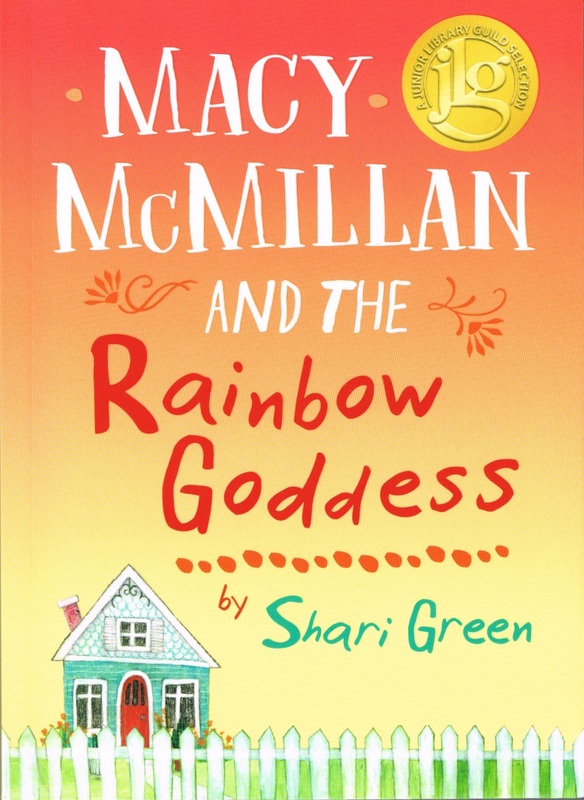 Thirteen-year-old Kate might wish for a ring just as her best friend has–Grace has an heirloom opal ring from her grandmother–but Kate's Ring is bigger than a child's dream to possess something special. That's because Kate's ring is not one of gold or silver but rather one of people and place. It's the 1920s and Kate lives with her five younger siblings–Michael, David, Lily, Colin and Sarah–and her parents in Whitney Pier on Cape Breton. 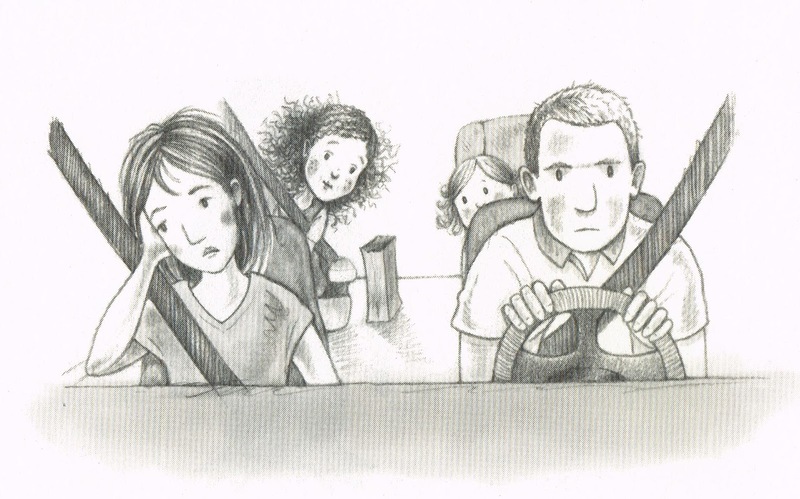 Though her story begins on a happy note with Poppa taking her out of school on her birthday to join him on his bread deliveries, Kate's story is not one filled with childhood joys. Mamma has consumption and is weak and often resting, while Poppa has started drinking and rarely at home. 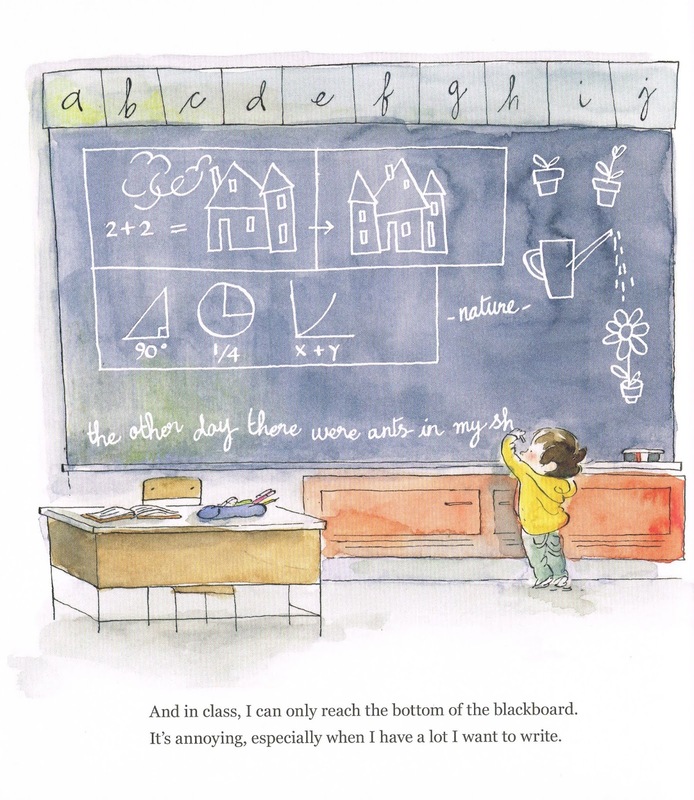 Sadly, the responsibilities for children and house fall to Kate, who begins to fall behind in school. While there is family around, including Mamma's mother and siblings, there is much strife especially from Aunt Flora who constantly berates Poppa about his drinking and Mamma who always forgives him his ways and despises her sister's interference. 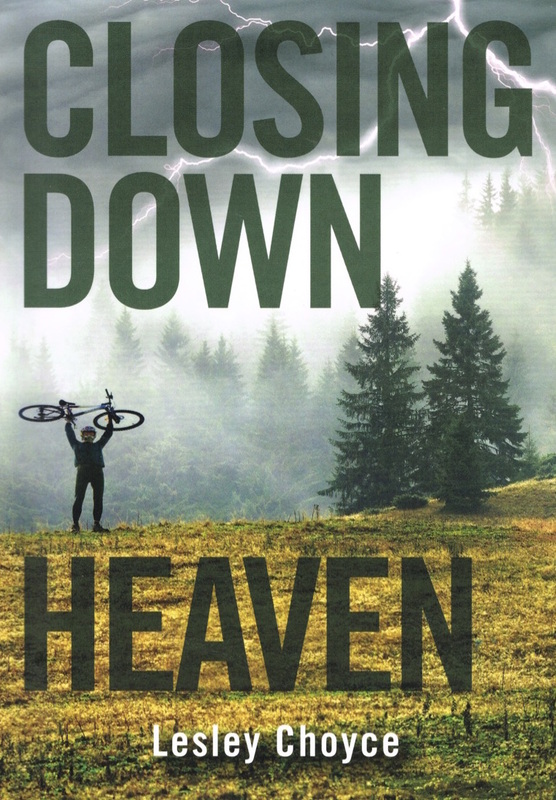 With Poppa unable to keep a job, he decides to get one logging on the mountain in Margaree, where his parents, Aigneis and Hector, live on a farm without electricity or indoor plumbing. 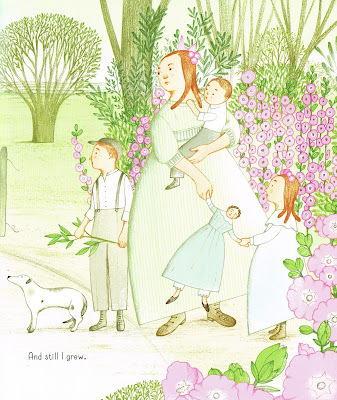 Mamma is thrilled to go, though Aunt Flora convinces her to allow Kate to stay with her and Uncle Will to finish her school year, as on the mountain only Lily and David would be going to school. For about three months, Kate experiences what it is like to have guardians who take care of her. They feed her, clothe her, love her and worry about her safety. Though her family is never far from her thoughts, she enjoys a real Christmas of family warmth. Then Aigneis insists that Kate join the rest of her family on the mountain as they need her help and her mother misses her. 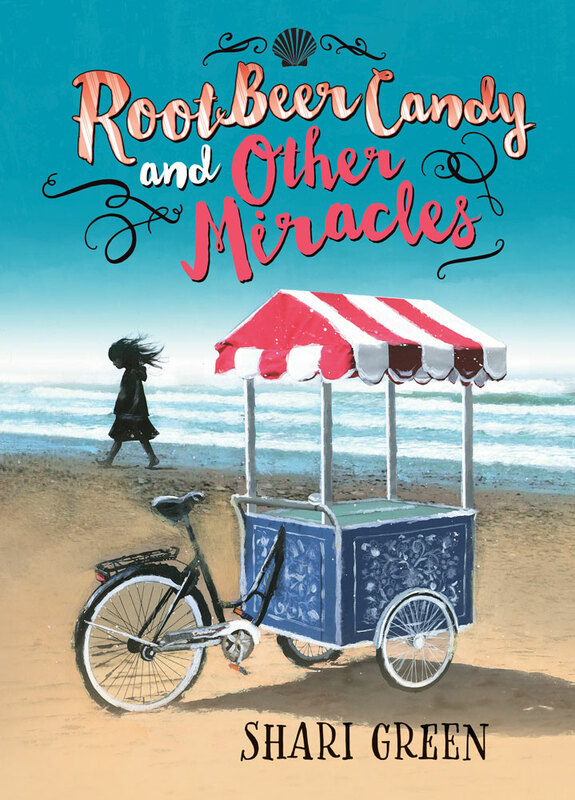 While her mother promises her that Kate will return to school and not end up in service, Kate wonders how her mother can make such a promise, especially with Mamma feeling worse and praying to never leave the mountain. Though Kate appreciates some aspects of her new life, like learning skills like carding and spinning fleece as well as participating in a céilidh, she is more than ready to return to Whitney Pier when Mamma starts coughing up blood and collapses. Though Aunt Flora continues to pass along money and food to the family via Kate, things are not much better with Mamma in the hospital. Unfortunately, things go from bad to worse and the family Kate has always known fractures with one tragedy after another. 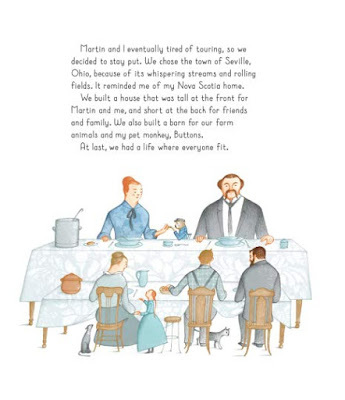 How the family will survive and in what configuration is only resolved through Donna Grassby's poignant storytelling, both heartbreaking and hopeful. Kate's Ring is not a story of lightness and familial comfort. 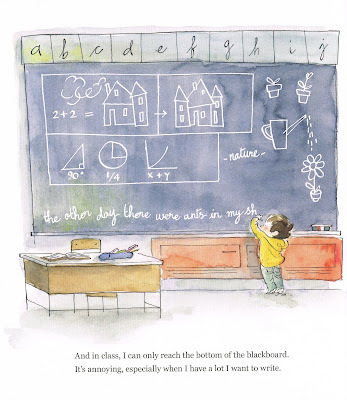 There are moments of joy, like when Kate's Aunt Flo and Uncle Will gift her with a pair of snowshoes or when she learns how to spin yarn, but Kate's life is more about responsibilities and chores and getting by. Sadly this probably has been the lot of many children whose families have had to deal with illness and financial woes, especially with parents who could not be there for their children because of their own troubles. 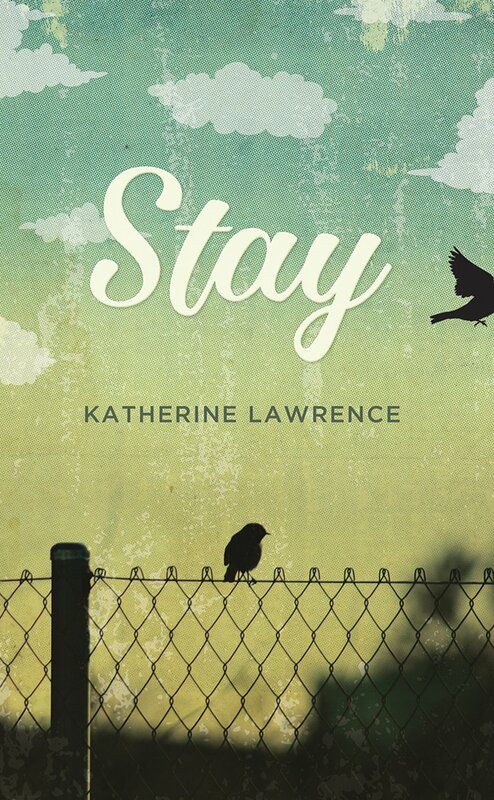 Still Kate accepts her responsibilities for her siblings and her family without much fuss; instead she just does what is expected and necessary while holding onto a sliver of faith that things will right themselves. 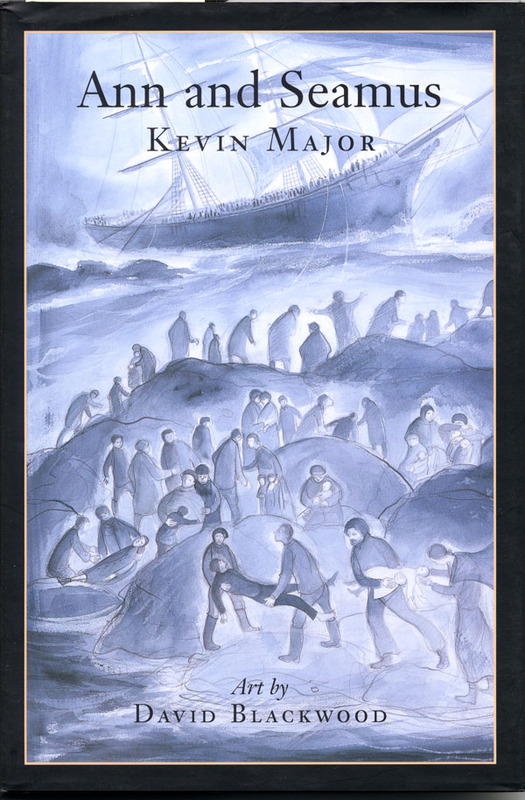 Even the book's cover upholds the idea that sometimes, even when you feel like you're a long way out from the safety of shore, there's more rain to come. 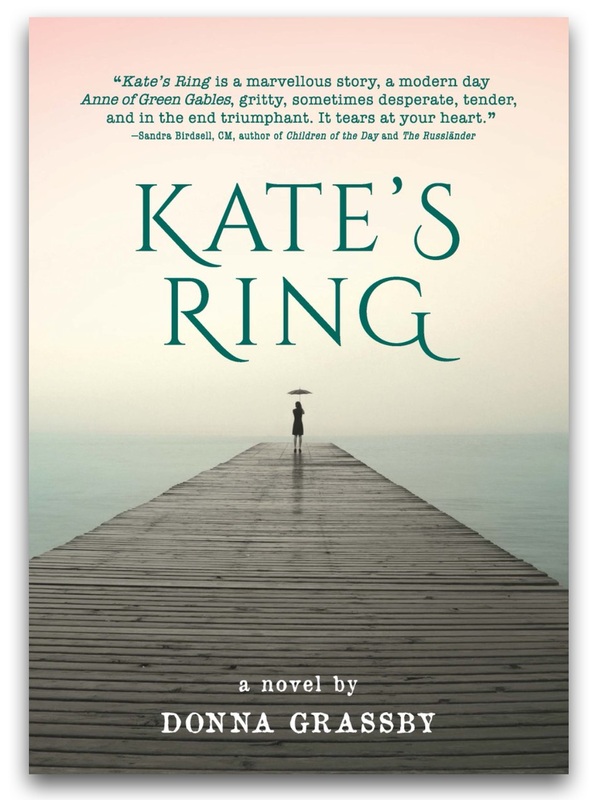 Setting Kate's Ring in 1920s Cape Breton, Donna Grassby makes sure young readers see that childhood was not always about play and school. Sometimes it was whatever was needed to help the family out. 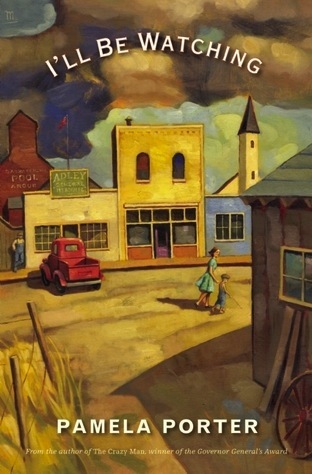 And by contrasting life in towns and in rural areas, where you might or might not have electricity and plumbing, where travel happened by horse, car and train, and not all children were fortunate enough to go to school, Donna Grassby embeds that story of loss and hardship in families of different shapes. It's family created, sustained and reconfigured that makes Kate's Ring real for the time and for now. 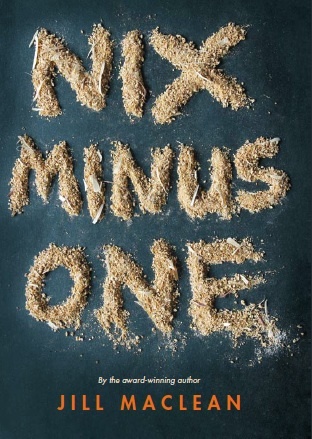 Recently I've had multiple requests from readers asking about novels in verse, a genre which is becoming more plentiful but which still isn't recognized as it should be. 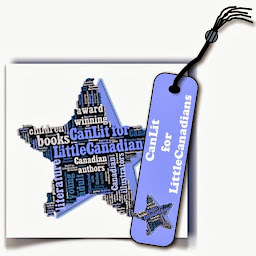 I had put together a post over six and a half years ago about youngCanLit written in free verse (see that original post here) and listed 12 titles. In a few short years, that list has more than doubled. 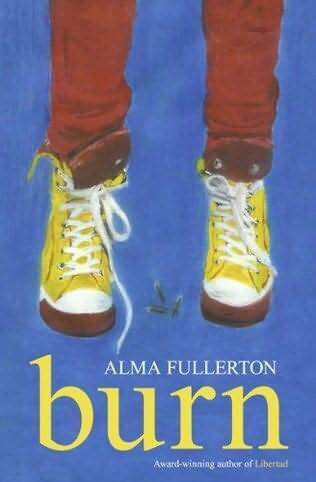 I'm pleased to share with you this updated book list of one of my favourite genres, the novel written in free verse style. Enjoy! Her name is Mimi but "I might as well be called Mini" because she is small. Of course it's all relative, as Mimi soon discovers, but still she knows that she is smaller than the rest of her family, even the dog, and her classmates and knows what a disadvantage she is at in the classroom and at the bakery, the butcher shop, the fish market and on the street. When will I grow big enough to take up as much space in the world as everyone else? But, it's all about perspective. 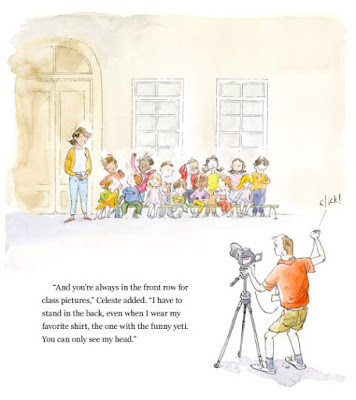 Her friends and family recognize the advantages of being small: getting to sit in the front row of the class photo; staying well hidden during a game of hide-and-seek; and preferential placement when queuing up in the cafeteria. But little Mimi only feels the frustration. 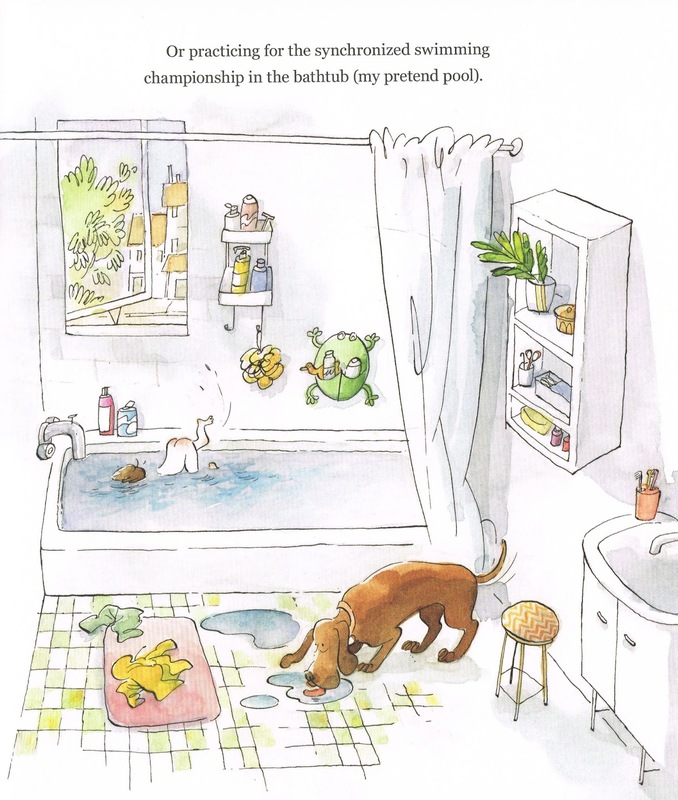 That is, until she starts to see from a different point of view: snuggling inside her parents' bed, pretending the bathtub is her pool, and riding the dog as a knight's steed. Then, when Mimi is introduced to her new baby brother, she realizes that he is "super small" now that she's a big sister. Though most families wouldn't trade those moments when children are very small for anything, it is the way of the world for children and young people to want to be bigger and more grown up. It's the grass-is-always-greener syndrome, which sadly even adults tend to adopt. 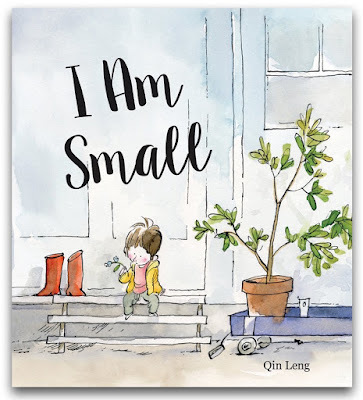 Whether author/illustrator Qin Leng was, as a child, smaller than her peers or now that she's a mother she is anticipating the lament of most children who always feel small and insignificant, I don't know. But I do know that Qin Leng can portray that angst sweetly in words and illustration. With the airiness typical of her artwork, Qin Leng brings the reader down to Mimi's perspective, even when we're seeing it from above. Maybe everyone around her thinks her smallness is not a big deal but, to Mimi, it definitely is. 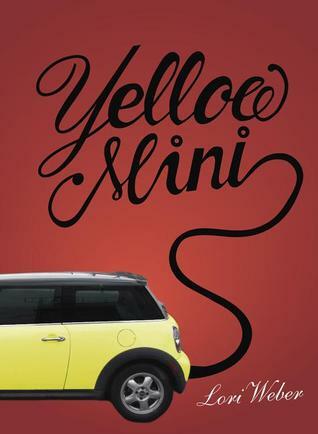 Minimizing her feelings would not be appropriate so Qin Leng finds the only way to show Mimi that she is more than just small of stature. 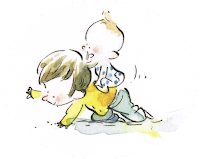 She is big in heart and importance, especially to a new baby brother who will need to rely on his big sister to help him find his own place in the world. 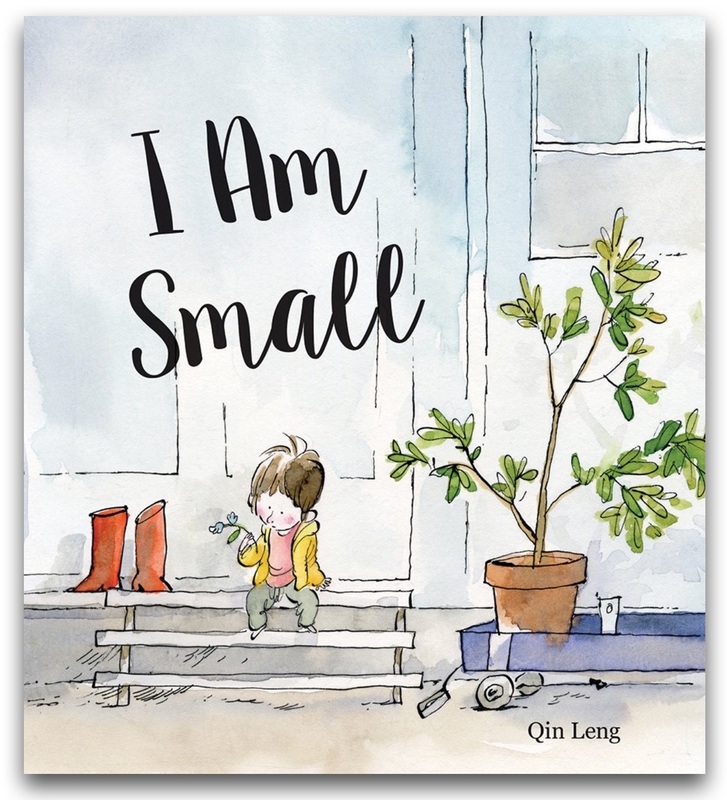 A French-language edition Je suis petite (Comme des Géants, 2018) is also available. There may be a grandmother, a basket of good food, and a walk through the woods, but this is no Little Red Riding Hood. 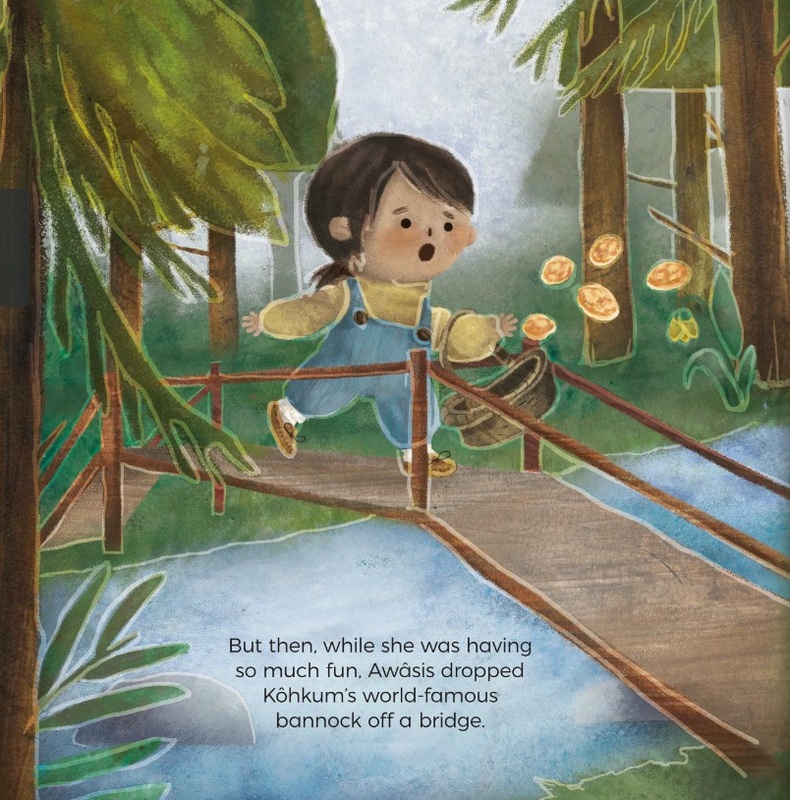 It's Awâsis and the World-Famous Bannock and this little girl is delivering the bannock from her Kôhkum when the animals of the forest come to her rescue. On her way to deliver her Kôhkum's world-famous bannock, Awâsis's walk takes a turn when the playful girl drops the bannock. It falls into the water to be picked up by a bear. In tears, Awâsis is approached by Sîsîp (duck) who reassures the crying girl by offering tohtosapopimehkan (margarine) which is needed to make bannock. 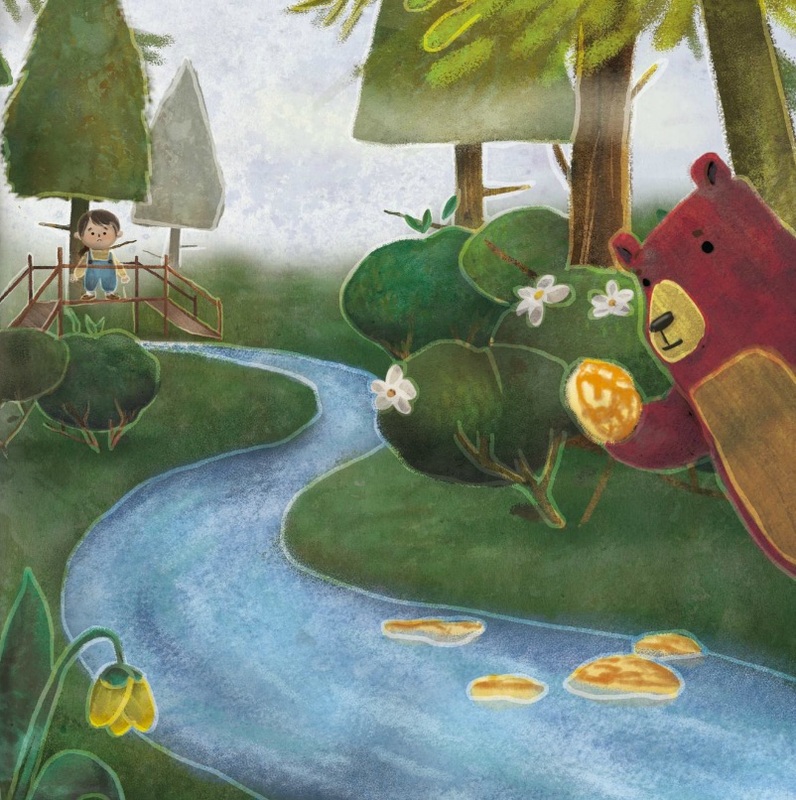 Similar encounters with Wâpos (rabbit), Ayîkis (frog) and Ônô (owl) yield her gifts of askipahkwesikan (flour), sîwinikan (sugar) and sîwihtâkan (salt), as the bear watches covertly. 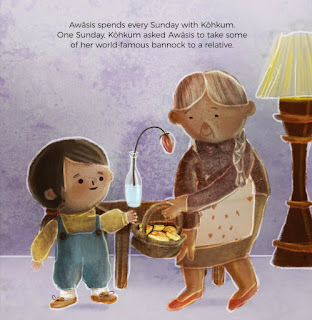 When Ônô suggests that she might have all the ingredients for the bannock, she runs home and explains to her Kôhkum what has happened. All that is missing is the tohtôsâpoy (milk) which is then hand-delivered by Maskwa (bear). 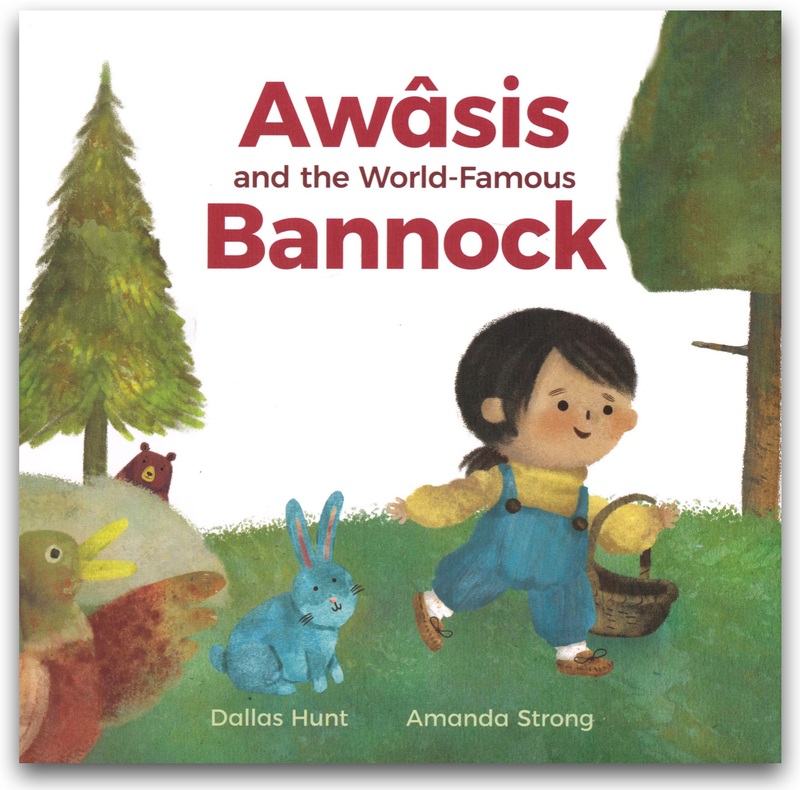 Complete with an easy-to-follow recipe for "Kôhkum's World-Famous Bannock" and a glossary of Cree words with a pronunciation guide, Awâsis and the World-Famous Bannock becomes less story book and more revitalization of language and fairy tale. 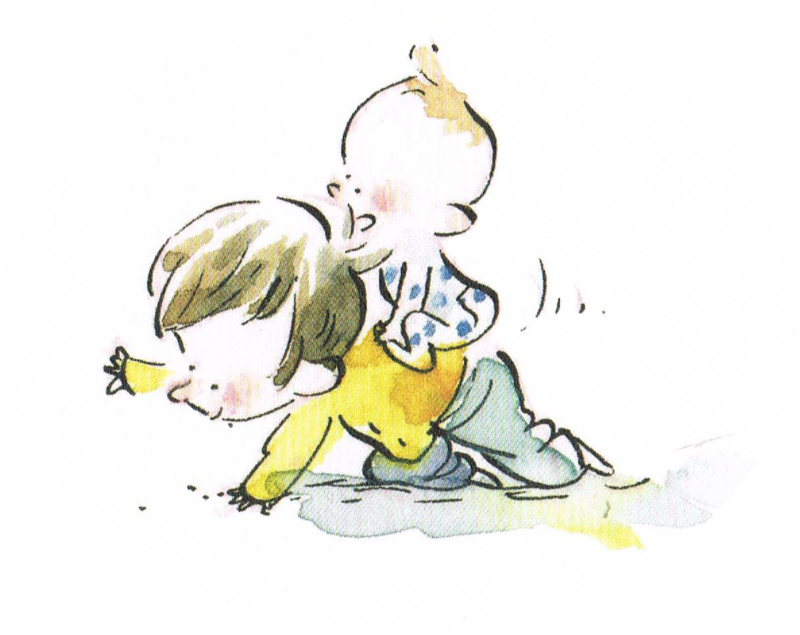 Although it may caution children to be a little less exuberant in their play when undertaking a task–though exuberant play for play's sake is always recommended!– it also shows that there are solutions for anxiety-causing dilemmas and sometimes they come from unlikely sources. Winnipegger Dallas Hunt, member of Wapisewsipi (Swan River First Nation), keeps the tone light, perfect for a joyful child who chats with talking animals on her outing. 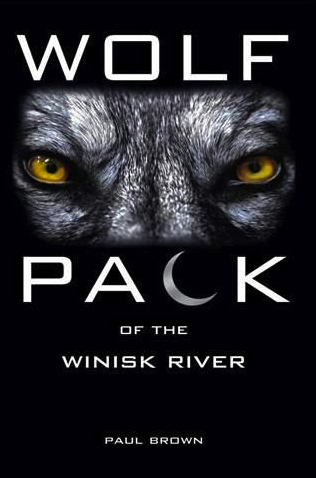 Still, though Awâsis's anxiety for her plight is apparent, through both her actions and her words, the reassurances of the animals are filled with compassion and encouragement. Artist Amanda Strong, probably better known for her Indigenous filmography, brings an organic feel to Dallas Hunt's story. 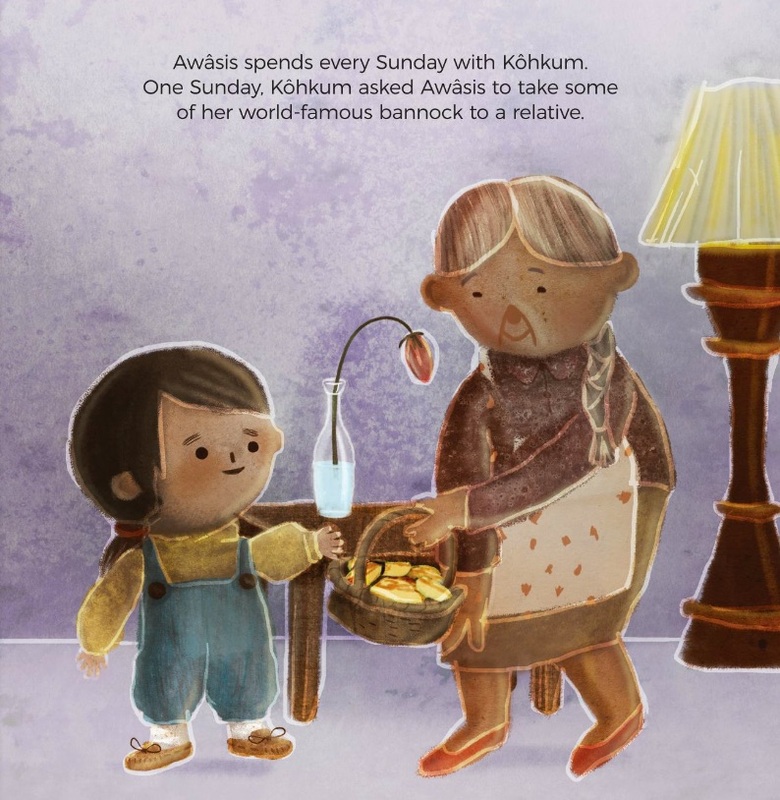 Outlining many of her illustrations' components in white borders, which I had never seen before in a children's book, gives Awâsis and the World-Famous Bannock the innocence of a colouring book while overriding that simplicity with textures similar to cut paper collages. 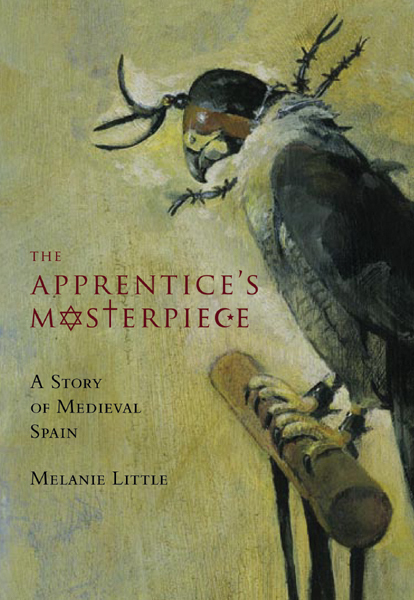 As such, the depth of the story is augmented by Amanda Strong's intriguing illustrations. Take a walk with Awâsis as she plays and chats with her animal friends, learning their names and greetings in Cree, knowing that Dallas Hunt and Amanda Strong will tell a clear story with ease while ensuring depth and naturalness of message in their words and art. A video uploaded by publisher Portage & Main provides a useful pronunciation guide to the Cree words highlighted in Awâsis and the World-Famous Bannock. 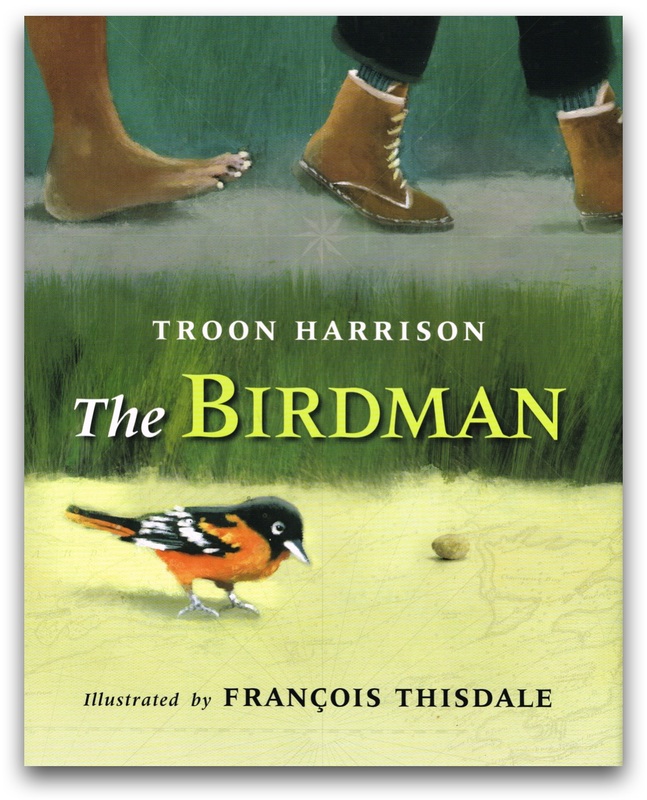 While The Birdman is an illustrated biography, more picture book than non-fiction text, similar to several I've reviewed in the last few weeks, the illustrations of François Thisdale, an artist of inimitable skill, blends the realistic with the ethereal and elevates Troon Harrison's story of abolitionist and birder Alexander Milton Ross (1832-1897) from storybook to art book. From his birth in the town of Belleville, Upper Canada and through his childhood, Alexander Milton Ross was brought up to appreciate and love the outdoors. 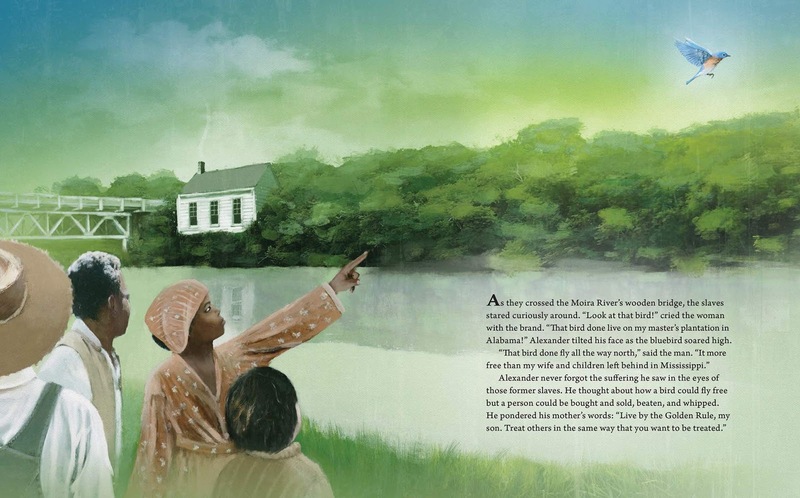 He probably would have been a naturalist if not for an incident in which his parents gave food and shelter to a group of escaping slaves and the young boy was shocked to learn of the tragedies of their lives while admiring their courage and determination to seek freedom. Alexander never forgot the suffering he saw in the eyes of those former slaves. He though about how a bird could fly free but a person could be bought and sold, beaten and whipped. 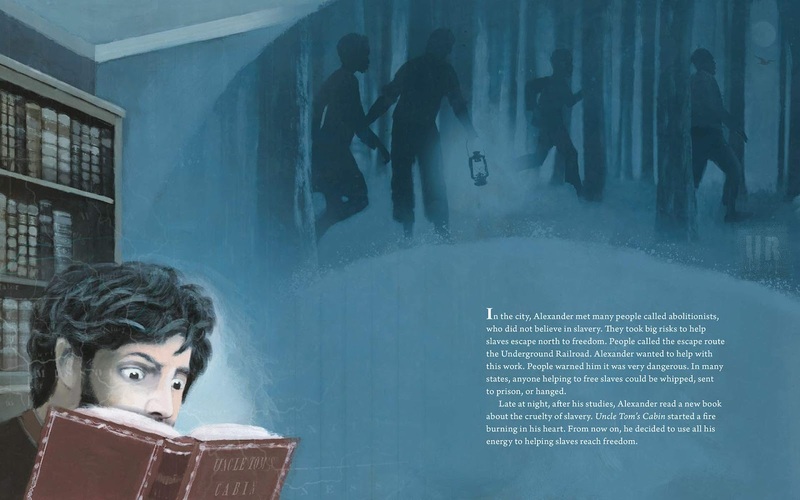 Following his mother's belief that "The most worthy ambition is to alleviate people's suffering", Alexander studied to become a doctor, while meeting abolitionists and reading Uncle Tom's Cabin which turned him onto helping slaves reach freedom. When he finished his medical studies, he travelled to Virginia and Tennessee where he met with slaves secretly to help them on their journeys, including providing them with items needed and teaching them a bird call as a signal to find help. When he became a wanted man for his work, he escaped to Canada, still helping a woman whose slave owner intended to marry her off, and learning firsthand the true terror of escape. 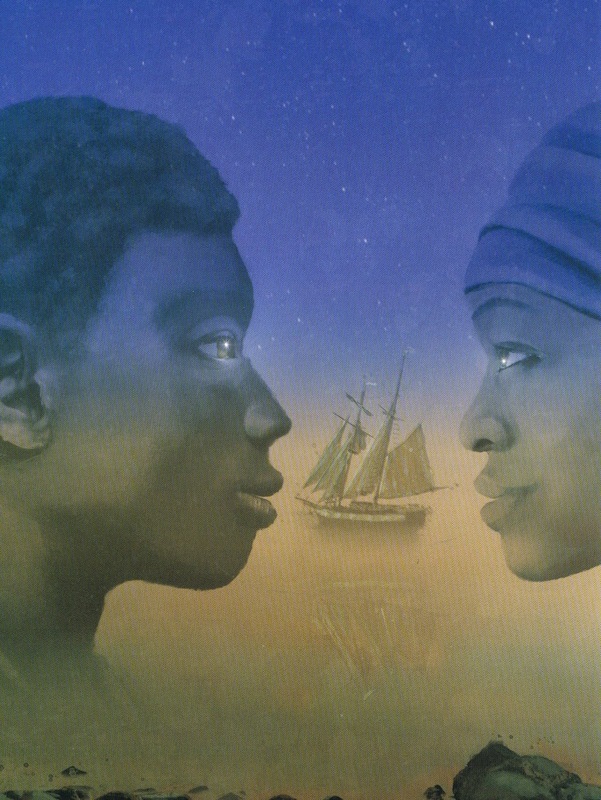 But Alexander Milton Ross would not diverted from his mission to help slaves escape to Canada. 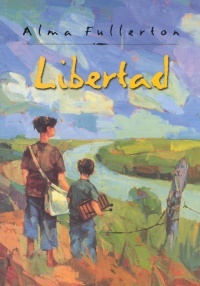 Now undercover as an ornithologist interested in the collection and classification of birds, Alexander got permission from wealthy plantation owners in states like Alabama, Mississippi and Kentucky to roam their lands, giving him the opportunity to secretly talk to the field slaves about the Underground Railroad and provide them with the information needed to flee to safety. He soon became known to all as the Birdman. Troon Harrison tells multiple anecdotes of Alexander's helping slaves escape as well as the tale of his own imprisonment–he was released when an escaping slave returned claiming that he hadn't escaped but was only late in returning because of a sprained ankle–all supporting Alexander Milton Ross's mother belief that it was important "to leave the world some better than you found it." 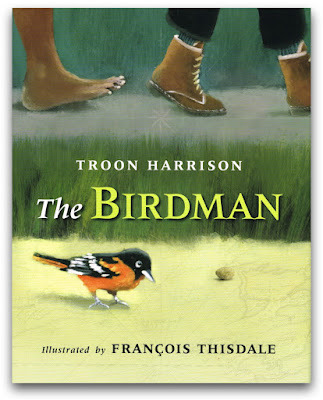 Troon Harrison weaves these events about Alexander Milton Ross's life into a compelling narrative of a compassionate man of action while François Thisdale's artwork gives the story depth. 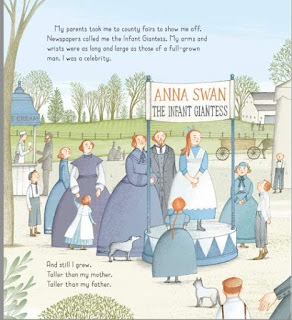 Look for the birds on almost every double-spread illustration of an outdoor scene. There's the oriole and the brown thrasher, the bluebird and the killdeer, and many more. They are all flying free or untethered, offering hope of a heaven in a new land where freedom might be found. In a fusion of drawing and painting and digital imagery, François Thisdale melds the natural world with historical realism and enhances the text of Troon Harrison by acknowledging the efforts of abolitionist Alexander Milton Ross while reminding young readers that sometimes courage is needed for worthwhile change to happen. 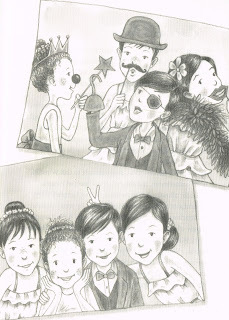 Stories about extraordinary people will always grab young readers' attention. They want to know how they lived, mundane and otherwise, with this need, subconscious or otherwise, to compare to their own lives. What would it have been like? How would they have managed the celebrity or the attention or the tragedies? 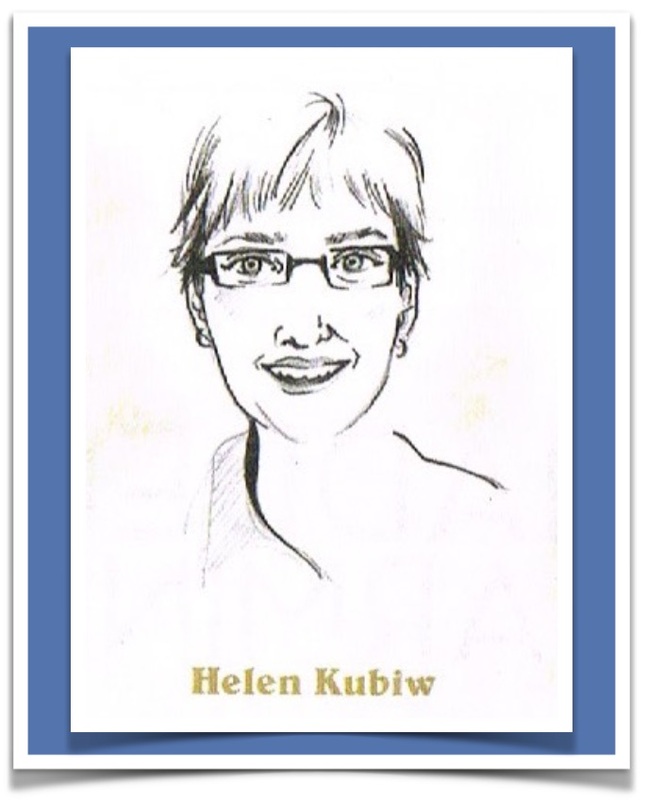 Biographies give us a glimpse into the lives of others while providing us with opportunities for introspection. 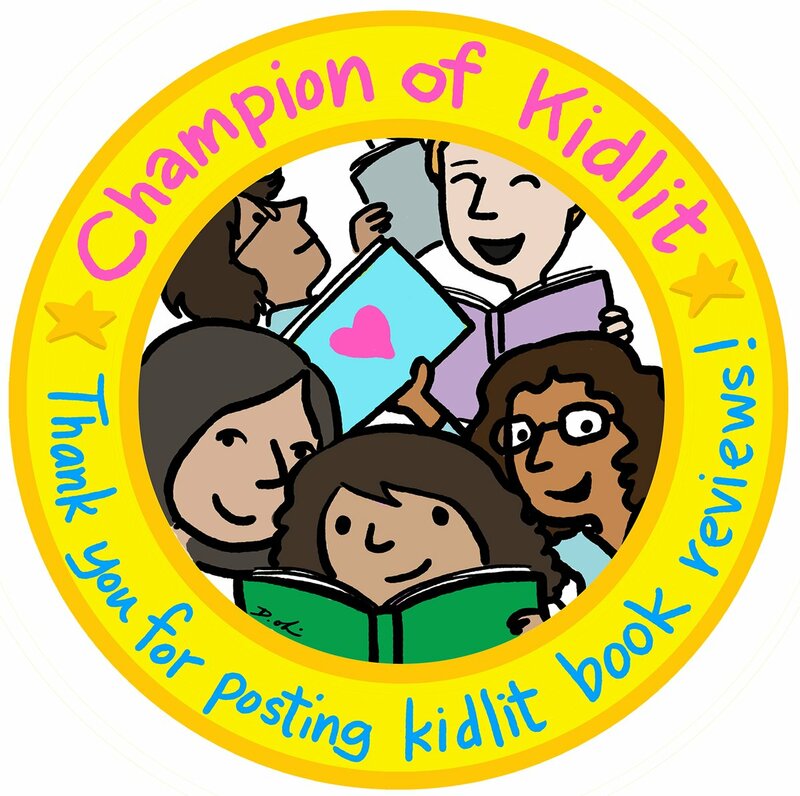 And for children, seeing into these lives can spark empathy and compassion and greater understanding about the world at large. 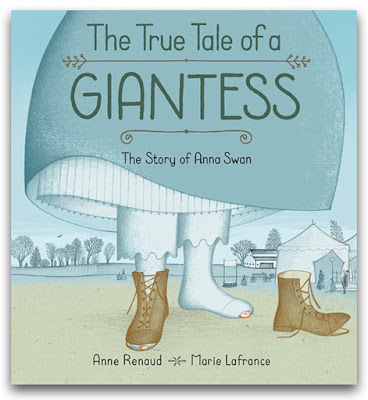 Though Anna Swan's story is undoubtedly greater than can be revealed in a picture book–Anne Renaud does append the story with more details about Anna Swan, including photos and references–The True Tale of a Giantess allows children the opportunity to learn and grow. The couple eventually settled in Ohio where they built a house with furnishings to accommodate them as well as their guests, adopted a monkey named Buttons and farmed. "At last, we had a life where everyone fit." Though Anna Swan is seen as a curiosity, Anne Renaud speaks little of her height and more about her experiences growing up and seeing the world before finding a way to make the world fit for her and those she loved. 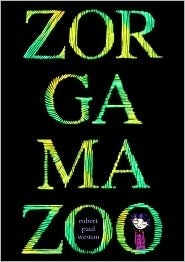 Thus, The True Tale of a Giantess is more about the positive messages of the wonder than the difficulties of the weird. Anna Swan is portrayed as a child of grace who appreciated her home and became a woman of dignity who showed compassion and acceptance. That gentleness of story is embodied in Marie Lafrance's drawings. From her soft lines of dress and nature to the greens and greys so prevalent in her colours, Marie Lafrance takes the reader to another time when girls wore long dresses and a little girl from Nova Scotia could become a celebrity as the Tallest Girl in the World.